Blackhawk 60LP00CT, 60LP00BK Laptop Backpack FREE SHIPPING! Travel with confidence knowing that laptops and other valuable electronics are safely secured in Blackhawk's new Laptop Backpack. Designed specifically for the transport of sensitive electronic equipment, the backpack features a generously padded main compartment that protects contents from damaging impact shocks. The compartment is sealed using waterproof YKK® zippers, ensuring water won't penetrate the pack or fry circuits. Four additional pockets offer secure storage and organization of laptop accessories and other important gear. A smaller top pocket employs an outside port for integrating smartphones, MP3 players and other devices. Padded shoulder straps with a removable chest strap offer comfortable carry that does not strain the back and shoulders. Each shoulder strap features HawkTex® and S.T.R.I.K.E.® webbing for secure attachment of additional pouches, holsters and accessories. The entire pack is constructed from weather-resistant, 500 Denier nylon with reinforced seams for maximum durability and protection. 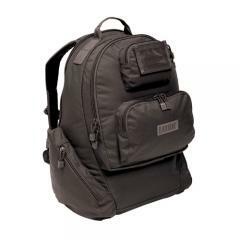 ©2002-2019 CopsPlus.com: Blackhawk 60LP00CT, 60LP00BK Laptop Backpack FREE SHIPPING!